Microsoft's X018, a live-streamed gaming event celebrating Xbox first- and third-party games with exclusive reveals, is set to kick off this weekend in Mexico City, and today Major Nelson has announced via Twitter more rewards are on the way for viewers who watch the stream on Mixer. Curiously, his tweet mentioning this in a video has since been deleted and the tweet was resent with just a static Inside Xbox logo, but we managed to grab a screenshot before it disappeared. The next episode of Inside Xbox will be recorded live from the event as well. 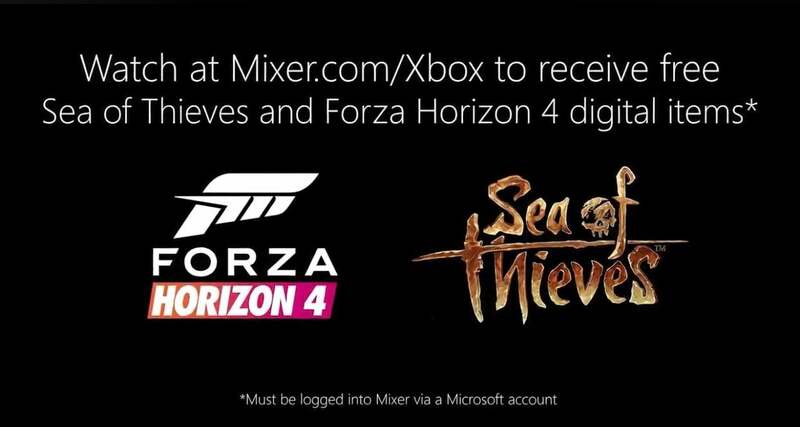 Two of the console's biggest 2018 games, Sea of Thieves and Forza Horizon 4 will be offering yet to be revealed in-game digital items to anyone who watches on Mixer with a linked Microsoft account. If you haven't yet linked the two accounts, find the steps here so you can reap the easy rewards this weekend. On top of those rewards, we also know some of the games that will be featured during the event, including the aforementioned Forza and Sea of Thieves as well as Minecraft, State of Decay 2, and Crackdown 3 all representing the first-party lineup. Third-party games will also be featured, such as PlayerUnknown's Battlegrounds, Shadow of the Tomb Raider, Jump Force, and more. What news are you hoping to hear from the stage of X018? You can tune in this Saturday, November 10th, at 1 pm PT / 4 pm ET / 9 pm GMT to catch all the reveals, and follow along here as we cover it all in depth as well.